Average Weight	: 45 -57 lbs. There is total disagreement about the origin of this breed. Dogs with spots are known throughout history in Africa, Europe and Asia. The breed may be related to the Pointer. Traces of spotted dogs are found in Egyptian bas-reliefs and Hellenic friezes, so it certainly is an ancient breed. In 1700 a dog known as a Bengal Pointer, similar to the Dalmatian, existed in England, calling into question the Dalmatian’s Yugoslavian origin. Some claim the Dalmatian is a Croatian breed. 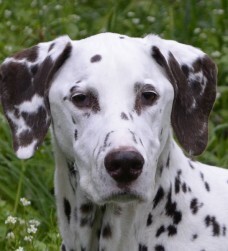 Efforts to have the Dalmatian recognized as a Croatian breed had been rejected, up until 1993, when the FCI did finally recognize the Croatian roots of the Dalmatian dog, although they continue to deny Croatia standard patronage rights over the breed. In the Middle Ages it was used as a Hound. In the 1800's the breed became popular as a carriage dog in Europe. Dalmations were used to clear a path before the horses, run alongside the coach or under the coach between the axels. He guarded the horses and coach when they were at rest and their Master was off leaving them to wait. To this day the Dalmatian has a natural affinity for horses. Dalmatians are a very hardy breed with great stamina. They were always able to keep up to carriages and horses sometimes having to run beside them for hundreds of miles. The versatility of the Dalmatian has kept it being 'pigeon-holed' at excelling at just one task. Whether a mascot for firemen on their trucks, being used as a war sentinel, a draft dog, a circus performer, vermin hunter, bird dog, trail hound, retriever, shepherd and even as a guard dog the dalmatian and their popularity has steadily climbed. Today it is grouped in the "Non-Sporting" Group within the AKC because of it's "Jack of All Trades ~ Master At None" reputation. This affinity took the Dalmatian on a different career path in the United States. They became useful to firemen running alongside the horse's pulling the fire equipment to the fire, watching over the equipment during a fire, and sometimes even rescuing people from burning buildings [this is here say]. When the excitement was over, they accompanied the fire wagons back to the station and resumed their duty as watchdog. Today most Dalmatians are companions and family members but many firehouses across the country still have Dalmatians as mascots. •	An ideal breed for joggers, skaters & cyclists and make great hiking partners. •	Keen competitor in canine sports such as flyball and agility. •	Intelligent and adapts well to discipline, borders and black and white rules. •	Do not respond well to harsh training methods. completely deaf. 23% are born with hearing in only one ear. •	Dalmatians also require to relieve themselves more than most breeds. •	Will get along with other pets and children if socialized early in their lives. On average, Dalmatians are an easy-going breed. You will have to spend time training your dog, but with a little patience and trial and error, Dalmatians become well-adjusted to their new surroundings and rules. It is best to establish feeding times, exercise times, and grooming times so the dog can develop a routine. Because this breed can become uneasy when new events take place, it is best to remain as consistent as possible. Spending quality time with your dog is very important as Dalmatians tend to get bored or depressed easily when left alone for long periods of time. If left alone all day, Dalmatians will need to be walked in the evening and extra on the weekends in order to release some of their pent up energy. Some Dalmatians may damage carpets, furniture, and other items in the home when they have been cooped up for too long or they have been left alone for more than a day. When going in vacation, it is best to board your dog or allow someone to dog sit. If left alone for days at a time, Dalmatians can become angry and destructive. Two major Health issues that are associated with Dalmatians are Deafness and kidney stones. While most litters will not contain any deaf puppies, up to 12% of all adult Dalmatians will become deaf at some point in their lifetime. This is due to genetics, poor Breeding, and in most cases, age. If your Dalmatian loses its hearing during adulthood, you would have laid the foundation of proper Training and the dog will know you well enough not to become startled when they don't hear you. Being patient with your dog is the way to handle the situation. As with any older dog, you should schedule yearly visits to your vet and seek advice if you think your dog is losing its hearing. Some dogs may only be able to hear in one ear, but this should not stop the dog from having a full life. Kidney stones can cause your dog pain, but fortunately, are not too common in most Dalmatians. Because some Dalmatians excrete undiluted uric acid from their kidneys, they can develop kidney stones, toxemia, and kidney blockage. While this is a condition that can be treated, you will have to take your dog to the vet to seek proper medication. Switching from a high protein dog food to something that contains wheat, corn or soy will help prevent kidney stones. Allergies and skin rashes may also occur if your dog is bit by a flea or tick. hip dysplasia may also occur in older dogs. Even though Dalmatians have a short coat, they still need to be brushed each week to prevent excessive shedding. Dalmatians love to play. They enjoy going for walks, running, and fetching. If you lead an active lifestyle and want a dog to take with you when participating in outdoor activities, then a Dalmatian is one of the best breeds to own. If possible, Dalmatians should be able to spend at least an hour outside each day. This means two walks per day, or spending more time outdoors in the evening. Dalmatians can also play in a fenced in yard if you have one. Because these dogs have a tendency to run away when unattended, you should monitor the dog while it is outside and make sure it cannot jump over the fence or knock it down. Dalmatians that do not get enough exercise may become angry or depressed. They may become aggressive and forego their routine. If you don't have the time to spend with your dog outside each day, you should consider another breed. Creating a daily routine will help prevent urination 'accidents' that will occur when you first bring the dog home. Taking your dog outside before you go to work, after you get home, and once more before bedtime will help your dog be able to have more control during the times you aren't at home. Daily routines will also make Dalmatians feel more comfortable around people and their surrounds. Developing a routine could take up to six months, but once your dog is trained, you will need to maintain the routine in order to keep your dog happy. Other types of training your Dalmatian may require are basic commands for public situations. Walking your dog in public will help them become more comfortable around people. When teaching new commands, give the dog a treat when they are successful. Every time they follow your command, give a treat. Do not use negative reinforcement with training your Dalmatian. Even though they are even tempered dogs, they could become angry when punished or verbally abused. Keep instructing your dog using positive reinforcement until they learn the commands. While it is easier to train a puppy, you can still train an adult dog with a little patience and consistency on your part. If you want to enroll your puppy in obedience training classes, wait until they are at least 5 or 6 months old. Most puppies can learn simple commands at this age. As your puppy grows, they will learn more advanced commands.